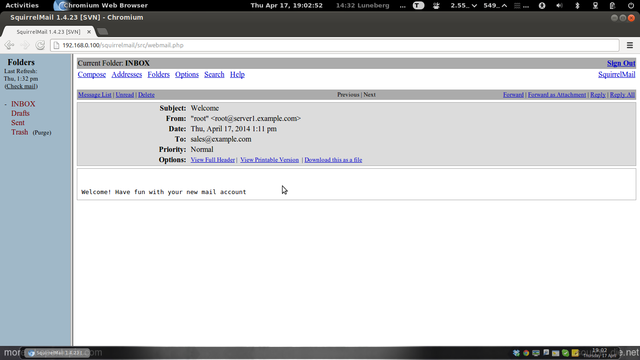 SquirrelMail is a webmail interface that will let your users send and receive emails in a browser. 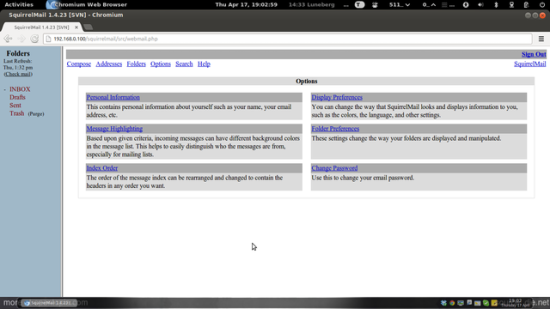 This chapter shows how to install it and adjust it to our setup so that users can even change their email account password from the SquirrelMail interface. // to connect to your database backend. A MySQL example is included below. // make sure this setting is empty. // and password pair are found in the database. // the user/password pair does in fact exist in the database. //      (including domain), such as "[email protected]"
//      any domain portion), such as "jose"
//      except %4 will have double quotes around it and %5 will not. // whenever a password change attempt is made. // Any number of queries may be included here. // The queries will be executed in the order given here. //      and %5 will not. // or one if the user should be forced to change it now. // to enable this functionality. // value empty and define a value for the $csp_salt_query. // to encrypt your passwords. // query is ignored if $csp_salt_static is anything but empty. // an HTTPS connection when users are changing their passwords. // port number here. Set to zero otherwise. 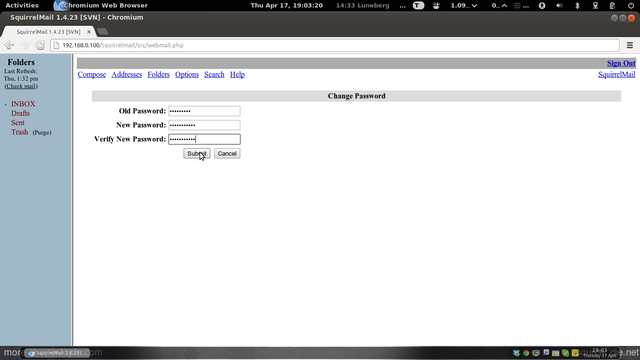 // in the vlogin configuration. // no limit should be applied. // lower case letter and/or one non-alphanumeric character. 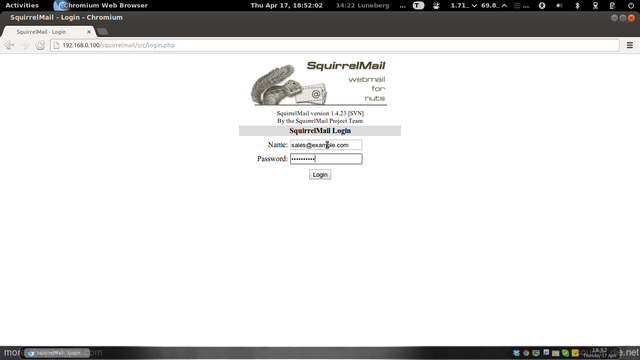 Now you can type in http://server1.example.com/squirrelmail or http://192.168.0.100/squirrelmail in your browser to access SquirrelMail. I was having issues with sending emails after using this tutorial. I found that when I went into the "/usr/sbin/squirrelmail-configure" command to configure squirrelmail, I had to go into #2. Server Settings then go into #B. Update SMTP Settings. I then edited #7. SMTP Authentication to use "login". This allowed squirrelmail to authenticate against the sql database and send the email. Thanks so much, I did not have almost any issue, but the tutorial is great. It was really self-explanatory. I must be super stupid, I have been trying and trying, with 12.04, 13.04, 13.10 and now 14.04. It just doesn't want to work. I don't want squirrel mail, so I stopped at the NUT stealer, I just want a working e-mail server where I can easily receive mail for multiple domains and add on the fly user accounts. Is the Squirrel my problem? But, this box should be running lean, no other stuff on it. Once upon a time I had it working, must have been around 11.04 or so and then there came an update along. Too bad that they don't encourage NOT to install updates. 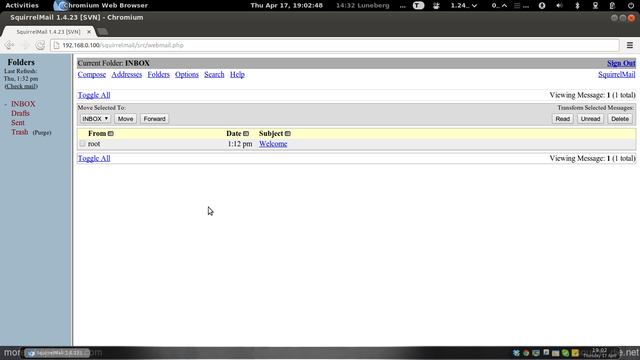 Since then, my e-mail server was broken into bits and I never got the thing to work properly. Believe, sometime in between, I fixed it and it worked again, not for long. Either on fresh installs or existing ones. There is something that I don't see, understand, overlook or whatever it may be. Sometimes, I get it to receive mail, but no sending. Sometimes, I get it to send mail, but no receiving. It's like my car, sometimes it works, other times I can only open the doors. Great tut, but didn't work for me for the past few years. Well, not Till's or Falkos's fault! P.S. I am running low power SBC's perhaps the Hardware doesn't digest the software easily. > Once upon a time I had it working, must have been around 11.04 or so and then there came an update along. Too bad that they don't encourage NOT to install updates. Since then, my e-mail server was broken into bits and I never got the thing to work properly. Believe, sometime in between, I fixed it and it worked again, not for long. Either on fresh installs or existing ones. If you installed a update that replaced postfix, then redo the postfix compile and Installation step from the tutorial to get a postfix Version again with virtual quota Support. Btw. there are easier to manage virtual postfix Setups here at howtoforge that dont requira a manually compiled postfix so that they are update safe. Take a look at the ispconfig 3 perfect Setup guides. Even if you dont use the webserver and dns Server parts from ispconfig 3, the mail part has much more functions like mail filters and autoresponders and it is easier to maintain and install then this virtual user guide. however, some of the problems surfaced already before postfix needed the quota support patched. Nowadays, DNS also will break (invalid keys) if an kernel update is installed. Sure there is a way for everything to fix/patch. I have totally lost my patience, though. 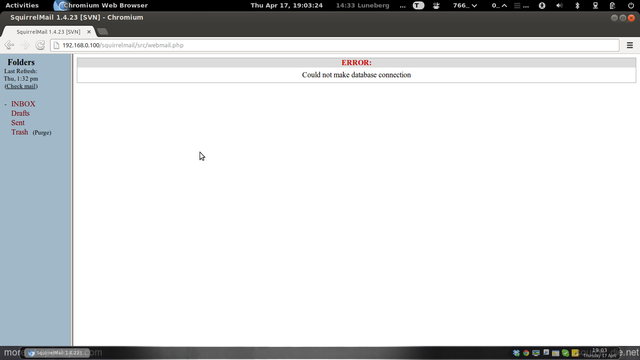 Perhaps, there is a hardware issue (instruction not there, unhandled error?) Ever since I switched to the SBC's I have this postfix problem. Actually, a cleaned out one of the boxes and installed 14.04 freshly. Same, result. Only this time, I can't receive nor send mail using a client. I've been running this (based on the 12.04 version) for a bit over a year and up to this point the webmail has fit the bill. Now I've got a user trying to use Mozilla's Thunderchicken and I can't seem to get the SMTP/send working. I've tried a wide variety of combinations but can't seem to get the client to be able to send mail. Congratulations for the excellent howto, very well explained. Thank you for this beautiful tutorial. i successfully installed mail server on my server and i needed a small config interface to add/delete users. Virtual Mail Admin Interface (VMA) given in the associated links section was too much hassle for me. It has another 'departments section' and name and surname for the email addresses. For that reason i created a small php file and now i can add/delete domains,users,forwardings and transport rules. Just download this php file and start using your mail server. Explanations are from the tutorial. Have a nice one!!!! Ps: Cannot add link and image from the comment section's editor on chrome.Why? the directories get created by postfix when the first email gets received in that Mailbox. Thats why the guide contains the step to send a test email. could someone, please give me a hint from where I loosed the path. Any plans to update this to 16.04?